On Monday I was in Eagle Rock for our fourth public hearing regarding the need for reform at the Department of Water and Power. We again heard from dozens of people who agreed on the necessity of fundamental and structural reform. If you weren't able to attend, you'll soon be able to find a video of the meeting on our website, speakoutla.blogspot.com. We will also be hosting another meeting next Monday, October 4th from 6:00 to 8:00 PM at the Los Angeles Harbor Commission Board Room at 425 South Palos Verdes Street in San Pedro, in partnership with Councilmembers Jan Perry and Janice Hahn. 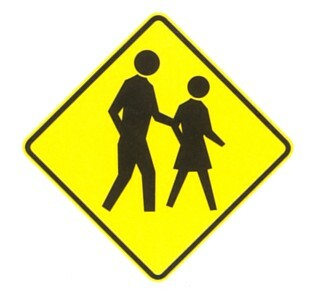 Metro will be hosting several two-day "Designing for Pedestrian Safety Workshops" in the coming months. The workshops will focus on ways for the city and region to become more pedestrian-friendly and will including a walking tour of areas needing improvement. All workshops will take place at Metro Headquarters, One Gateway Plaza, Los Angeles, CA, 90012 (adjacent to Union Station). To register, e-mail ped@metro.net and include your name, organization, department, job title, phone number, and email/mailing address, or call Adela Felix at (213) 922-4333 or Julie Leung at (213) 922-4373 for more information. Registration is required to attend. Children's Hospital of Los Angeles and the Aviva Family and Children’s Services Foundation will be presenting two free parent workshops on the 29th and 30th of September from 6:00 to 8:00 PM. Wednesday the 29th's workshop will focus on the dangers of inhalant abuse and be held at Lemon Grove Park at 4959 Lemon Grove Avenue. The workshop on the 30th will deal with substance abuse and will be held at the Youth Policy Institute at 5500 Hollywood Blvd., 2nd floor. For more information contact Jennifer Alfaro at (323) 876-0550 Ext: 1143. Project Restore is kicking off the Hollyhock House Historic Restoration and Seismic Retrofit Project with a free public wine tasting on Thursday, September 30th at 4:00 PM at the Barnsdall Art Park on the Hollyhock House West Lawn, 4800 Hollywood Blvd. To register go to tinyurl.com/23ahkve. Free parking is available. If you haven't gotten a chance to attend one of our public meetings on the need for reform at the Department of Water and Power, we will be hosting our fourth meeting on Monday, September 27th, in Eagle Rock. It will be held at the 20th Century Women's Club at 5105 Hermosa Avenue from 6:00 to 8:00 PM in partnership with Councilmember José Huizar. 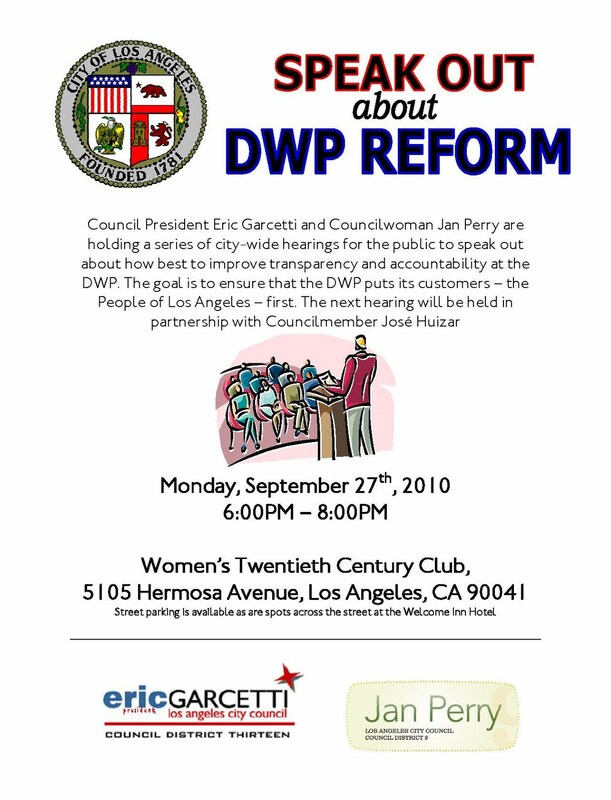 These meetings offer a chance for the public to weigh-in on proposals to improve transparency and accountability at the DWP, including my plan to put a City Charter amendment on the March 2011 ballot to establish an independent DWP customer advocate’s office. 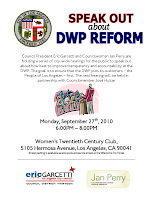 The third in Garcetti's citywide series of hearings on DWP reform will continue Thursday, September 23 at 6 p.m. in South Los Angeles at the Constituent Service Center at 8475 S. Vermont Ave. Los Angeles, CA 90044. 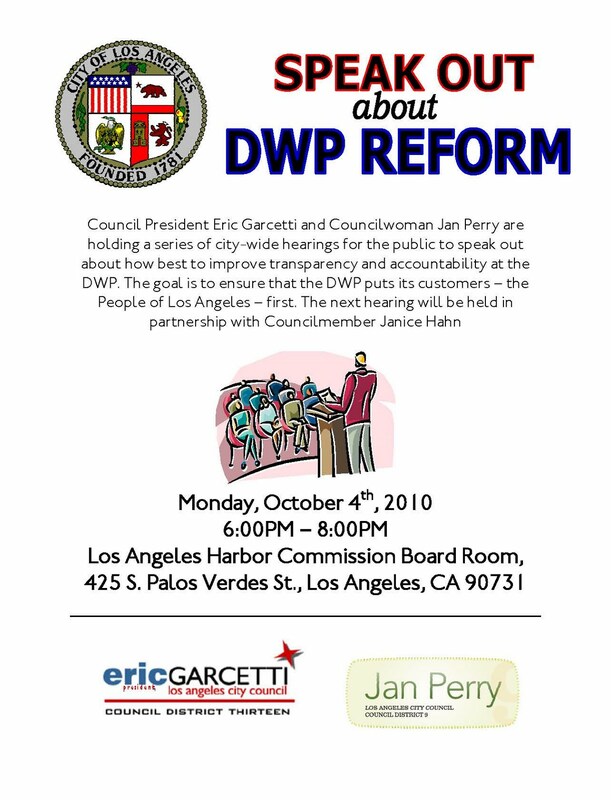 Garcetti is leading these hearings to obtain input from Los Angeles residents to help shape his plan to reform the DWP and other proposals to increase transparency and accountability at the agency. This joint hearing of the City Council's Rules and Energy and Environment committees is being held in partnership with Council President Pro Tempore Jan Perry (Chair of the Energy & Environment Committee) and Bernard Parks, in whose district the hearing is being held. The goal is to ensure the DWP puts its customers – the people of Los Angeles – first. Garcetti believes DWP's top priority must be its customers, and that real DWP reform starts with an independent watchdog to enforce transparency and accountability at DWP. To make sure that happens, Garcetti feels strongly that DWP's customers -- the people of Los Angeles -- must have a seat at the table. 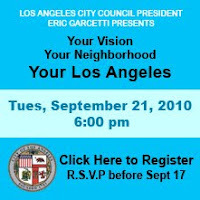 The hearing offers a chance for neighborhood residents, business owners, consumer advocates and experts to weigh-in on plans including Garcetti's Charter amendment that is proposed for the March 2011 ballot to establish an independent DWP watchdog who would serve as a ratepayer/customer advocate. Garcetti's Charter amendment measure would establish this office outside of the DWP or any political office. Garcetti chose to pursue a Charter amendment because only voters can change the Charter, protecting this independent watchdog from political or DWP interference. Garcetti has also passed through the Council a proposed Charter amendment to ensure public scrutiny of the DWP budget and minimize the uncertainty the DWP can inject into the overall city budget process. His plan would require the DWP to publicly present its budget well in advance of the budget deadline and would change the current deadline that allows the DWP to pass its budget after the city passes its overall budget, as was the case this year. Garcetti accelerated his DWP reform agenda after the agency demanded an up to 28% power rate increase this year, one which many regarded as unreasonable and unnecessary. The Council beat back that rate increase and a City audit later revealed that the DWP misled the public in justifying its call for the increase. The City of Los Angeles has a new planning director and I want to make sure he hears from you first, which is why I'm holding a town hall meeting on Sept. 21 where the new director, Michael LoGrande, will answer questions and discuss his vision for the city. See the blue "Your Los Angeles" button on the right side of my homepage for details. If you can't make it to the meeting, you can click on the "Speak Out Los Angeles" button on the right side of my homepage and submit a question or vote for one already submitted. Anyone can see posted questions. You will need a free Google account to submit or vote on a question. Or, you can submit a question, vote for one or provide other feedback by sending an email to councilmember.garcetti@lacity.org. The most popular questions will be asked at the meeting. No one knows more about our neighborhoods than the people who live there. So let's speak out and make sure our Planning Department knows what's on your mind. of that country underwater at one point, and today more than 10 million people are displaced. Their recovery will be delayed not just by the magnitude of the floods, but by the growing outbreak of disease, the wiping-out of next year's crops and the washing away of entire families' property and wealth. 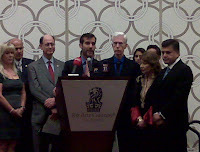 This week, I was proud to join the the Association of Physicians of Pakistani Descent of North America's (APPNA) Southern California Chapter at a huge event in Downtown to raise relief funds and to get the word out that this is a disaster that by many measures is larger than the recent Haiti earthquake and the great tsunami that swept through the Pacific combined. With me were Gov. Gray Davis, Sheriff Lee Baca, Controller John Chaing, and Congressmembers Howard Berman, Brad Sherman and Judy Chu, who all gathered in support of APPNA So Cal President Dr. Asif Mehmood's efforts to ease the suffering in Pakistan. I understand times are tough, but I also know that Americans have always been the first to respond when others are in trouble, no matter where they are. I also have a firm belief that the United States will make its mark as the world's remaining superpower not just because of our economic and military might, but because of the care and compassion displayed throughout the world by the American people. If you are able to help the victims of the Pakistan flood, please contact the APPNA Southern California Chapter at www.appna-socal.org. 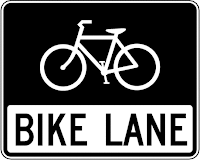 Hearings and a "webinar" to talk about and get feedback on the city's new draft 2010 Bicycle Plan, which is intended to increase traffic safety, reduce congestion and clean the air. This is a great way for the people of Los Angeles be directly involved in the city's transportation planning in person, or from your computer at home or work. series of citywide hearings on DWP reform and to talk about my proposal for an independent DWP watchdog to ensure transparency, accountability and fair rates, as well as my proposal to ensure public scrutiny of the DWP budget. Councilmembers Jan Perry, Bill Rosendahl (in whose district we were welcomed), Janice Hahn and I heard from dozens of people who agreed that there is a need for fundamental reform at DWP. There was strong support for the creation of a tough watchdog office with significant resources at its disposal, saying that would be an investment that would pay off for DWP customers. Like the people who spoke at the first DWP reform hearing in Northridge, the people we heard from respect the DWP's job of providing water and power to our city, but want there to be trust between the Department and its customers so that they can be assured that the DWP is acting in line with its mission. 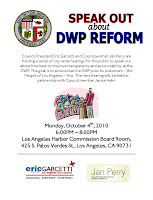 The next DWP reform hearing will be held with Councilmember Bernard Parks in Council District 8 on September 23 from 6pm to 8 pm at the Constituent Service Center at 8475 S. Vermont Ave. Los Angeles, CA 90044. The Barnsdall Art Park Foundation's Saturday Outdoor Movies series will screen each Saturday this month a film that showcases the architectural and historical uniqueness of Los Angeles. The series starts this Saturday, September 4, with "500 Days of Summer." Bring a blanket and a picnic, or travel light and pick up on-site wine and Eagle Rock Brewery microbrews served by El Prado Bar, hot dogs from the Let's Be Frank truck and Lake Street Creamery ice cream. Doors open and drinks are served starting at 5:30 pm; screenings start promptly at 7:30 pm. The series continues on Saturday, September 11 with "LA Story," on September 18 with "LA Confidential," and on September 25 with "Who Framed Roger Rabbit?" All screenings are 17+ except for Roger Rabbit, which is open to all ages. The films are being screened on the West Lawn of the historic Frank Lloyd Wright Hollyhock House. Free parking is available at Barnsdall Art Park and at Kaiser Hospital on Sunset just west of Vermont. Better yet, the Vermont/Sunset Metro Red Line station is right next to the park, as are multiple bus lines. All proceeds will support Barnsdall Art Park Foundation programs and projects including free Sunday art classes for children and families and restoration of the historic Hollyhock House. 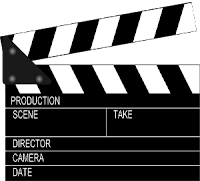 For more information and tickets, visit http://movies.barnsdall.org. when the economy goes down, crime goes up. A huge part of that success is because of the ever-strengthening ties between the officers of the LAPD and the communities they serve. Charlie Beck, who rose through the ranks before being appointed Police Chief, will speak at the September General Meeting of the Glassell Park Improvement Association at 7 pm on September 16. The meeting will be held at the Glassell Park Community and Senior Center, 3750 Verdugo Road, Los Angeles, 90065 (south side of the Public Storage building, next to the park). For more information, contact gpia90065@gmail.com.